This essay was developed by John Mayer, executive director of the Amesbury Carriage Museum. In addition to leading a variety of museum projects and initiatives, John is a member of the industrial survey team and enjoys exploring the many interesting details about worklife in Amesbury. 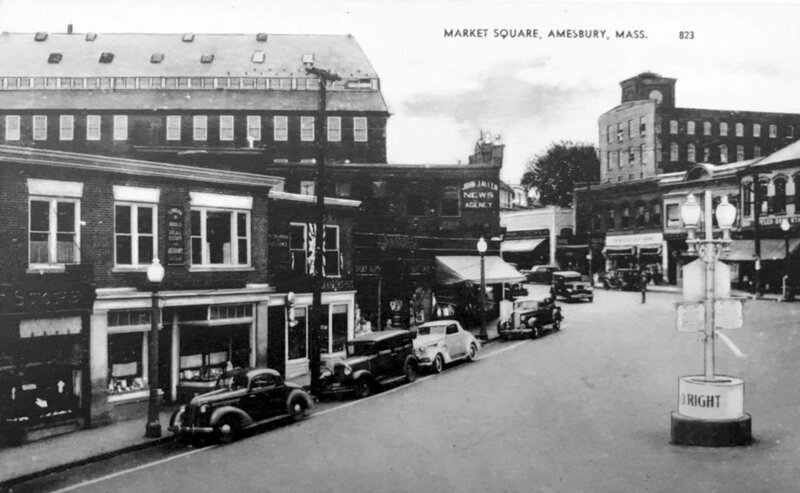 Today, the area around Amesbury’s Market Square includes many buildings from the nineteenth century that once were part of Amesbury’s textile-making companies. The earliest textile mill was built in 1812 and the last in 1872, with many additions and alterations made to the millyard during those years. At the peak of textile making activity in the 1870s – nearly 900 people worked in the mills – a time when the local population numbered around 9,000. One of the largest and most distinctive mill buildings was erected in 1862 on the corner of Main and Friend streets and immediately played a role in generating woolen cloth for Civil War troops. When Mill 8 was completed people in town celebrated with a “great fair” to support the moment. Mill 8 was built in an “ell” shape with two wings – the Main Street façade was nearly 100 feet long and six stories tall; the Friend Street façade was 200 feet long and five stories tall. There was around 100,000 feet of space for the spinning machines and looms. Most notable was a clock tower that served to announce the work hours – much like the noon whistle that blows today. This view from Market Square shows the stair and clock tower and the massive presence of Mill 8 – built in 1862. Textile making was only one activity that occurred on the site of Mill 8. In 1796, Jacob Perkins, an inventor from Newburyport, built his factory here and began to produce nails using his patented machinery – the first fully mechanized nail-making factory in the United States. The steep drop in the Powow River at this location provided the power needed to drive the machines. The upper dam (standing today) created the reservoir for the water that flowed through a raceway to a large waterwheel in the factory. While there is no image of Perkin’s nail manufactory, the 1825 map below shows the footprint of the nail factory (and rolling mill) and its location along the Powow River. For comparison, an 1885 insurance map that shows the location of Mill 8 – which was built on the foundation of the nail works. As unique and innovative as the Perkin’s nail factory was – it only operated until 1825, and the mill site was purchased by the Salisbury Manufacturing Company. Competition and even more efficient machinery pushed the nail making operation out of business. Nonetheless, Amesbury people can be quite proud of our contribution to American technical innovations. In 1825, the newly-formed Salisbury Manufacturing Company began to develop their textile-making operations on the property they had just acquired. They built Mill 2, which today is the home of Amesbury Industrial Supply, they converted the nail and rolling mill for textile making operations, and they begin to use the area known today as the upper millyard for a wide range of activities – from dyeing to storing the finished fabric. Water from the Powow River was essential as a source of power and as a supply of fresh water for processing the textiles. The detail below from an 1849 map shows the nail factory and rolling mill and other structures used by the Salisbury Manufacturing Company. In Amesbury, just as in other New England towns, during the nineteenth century the textile industry became an important – if not dominant part of the local economy. Operations continued to expand. In 1854 the Salisbury Manufacturing Company merged with other firms and together formed the Salisbury and Amesbury Textile Company. This consolidated corporation shaped the area we think of as the upper and lower millyard. With a need for textiles of all sorts to make uniforms, blankets, and other war-time goods – New England textile manufacturing companies responded and expanded their operations. In 1862, the Salisbury Manufacturing Company completed Mill 8 – this was their largest mill with over 100,000 square feet of space, operations on six floors, and a façade on Main Street and projecting to the north along Friend Street. Machines in the building were driven by a 900 horsepower turbine powered by water drawn from pond created by the dam in the upper millyard. Its hard to know how many people worked in the mill – their work spinning, spooling and warping yarn was essential for other operations and part of the process of making woolen and cotton cloth. The photo below from about 1900 shows a spinning room in one of the Amesbury mills – possibly Mill 8. And just like other textile mills in New England, the Amesbury companies did not survive changes in the economy. What had become the Hamilton Woolen Company in 1880 operated until 1914 when textile manufacturing shifted to operations in the southern states. The mill buildings and equally important water privileges were bought by a new company – the Merrimack Valley Power and Building Company. This new company began to lease space in the mills to auto-body manufacturers and a wide variety of other businesses. The company added hydro-electric plants at the Lake Gardner Dam and at the location of Mill 6 on Mill Street. The amount of available floor space exceeded the need so building owners began to modify their buildings. In 1929, the Main Street section of Mill 8 was removed and in its place a new block of commercial stores was built. Ca. 1940 view of the Main and Friend Street storefronts. A portion of Mill 8 is visible in the upper left. Tragedy struck Mill 8 on the morning of November 11, 1950 when a fire began in the basement and quickly spread through the building. Fire fighting companies came from the region to assist Amesbury firemen, but to no avail – the building was a complete loss. The location of what was once a nail factory and then one of the largest textile mills in Amesbury is mostly a parking lot. The Newburyport Five Cent Savings Bank on Main and Friend Street occupies a portion of the site and includes a clock tower that represents what had originally been part of Mill 8. Walking the millyard today there is hardly evidence of this important part of Amesbury history. The importance (and joy) of studying local history is to explore the events that shaped our community and share these stories as a way of building our collective sense of place.